The season of Halloween is full of fun and spooky activities. Some of the things we may not be considering is whether or not our pup is going to be okay with the festivities. Along with treats, there are tricks and dangers for our beloved canine companions. Cutting and carving pumpkins is an age-old Halloween pastime. For pups, pumpkins can be sweet and tasty, and rather safe to nibble on, but can sometimes end up in an upset tummy, especially for those rascals that are food sensitive. While the pumpkin itself may not always pose a problem, the candle inside might. Make sure you keep a lit pumpkin away from the pup, or the pup away from the pumpkin. They can knock them over, causing a fire, or burn themselves with curiosity. Decorations are fun, especially the spiders and jack-o’-lanterns that light up. But be cautious as power cords can be dangerous, especially in the jaws of a curious pup. They may find that them make a great chew toy- especially young ones that are teething. 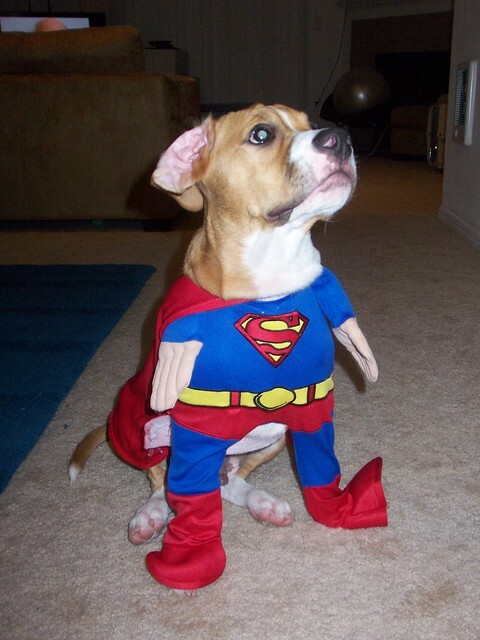 Dress up is fun for both parents and kids alike, but what about our pups? They can join in on the fun too, of course. But, not every dog is going to be okay with wearing an out of this world outfit. Each dog has a different appreciation for costumes, so keep their wants in mind. Make sure it’s not going to be too hot for them and that they’re okay with wearing it. Double check that there are no low hanging or dangerous aspects, such as strings or attachments that can get caught or chewed and eaten. A pup partaking in the fun should still be watched carefully. A leash should be kept handy or attatched at all times, especially when trick-or-treaters ring the doorbell. The open door can be attractive and exciting, so be careful the rascal doesn’t make a quick getaway. You’ll end up chasing him around or he may end up in a busy street. Most importantly, don’t forget that having their ID on is crucial. Don’t take it off just because it doesn’t go with their costume. Keep your pup’s interests in mind. A lot of excitement is about to go down as new and unfamiliar people are going to be at your door quite often. If your pup doesn’t care for all the activity, it may be best to seclude them in a quiet, safe area such as their crate or a room. Offer them a treat and some toys to keep them happy though. Just because they can’t partake in the festivities doesn’t mean that they can’t have some fun of their own. If you decide your pup isn’t going to enjoy the activities, be sure and put them in a safe area. While the backyard may seem like a nice, secluded spot, there are some folks out there looking for mischief. Don’t leave your pup unattended where they might become a target for a nasty trick such as an egging or having other items thrown or fed to them. Candy is not really good for us- but it’s even worse for pups. Chocolate and other sweets can be toxic for pups, so keep it away from their curious paws. That means the wrappers, too. They still smell good, but can get lodged in their throat or intestines. The last thing you want to do is end up at the vet on Halloween night. Be sure and consider your pup’s thoughts on Halloween. Don’t make them do things they don’t want to, and keep the evening a fun and safe one for the whole family.